We were eager to explore all the things to do in Porto Portugal. 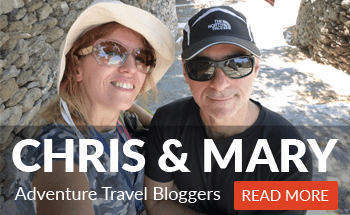 We visited Lisbon, Cascais, Sintra, Fatima in Portugal and Porto was much expected. Porto wine was one of the reasons. Driving there from Lisbon was a really comfortable and pleasant experience. It is a 3 hours drive, which is not too much when you consider all the nice places you see along the way. Porto, Portugal, is smaller than Lisbon but it takes quite some time (days) to explore it in a thorough way. It is a city to walk through and stop every now and then to have a good look of the surroundings. You won’t see numerous architectural marvels but the overall local color, tastes and wine and promenades, are definitely great “soul food”. Portugal seems rather relevant to the Spanish culture but also it is not. From music to foods to architecture, all seem a bit familiar but also very different. For us Porto was the final destination in that trip in Portugal and a nice “closure”. Portugal needs further exploration though, and we plan to go back. Enjoy our experience and let us know if you’ve been there. Is There a Porto Beach? Where to Stay in Porto, Portugal? One of the first things is to find a parking spot… We drove to Porto and finding a place to leave our car was not easy. Eventually, we decided to drop it in a paid parking station which seemed rather cost affordable, only 0.5 euro per 15 minutes for a 6 hours period. The parking was near Porto centre and that allowed us to dive into Porto history. Best thing to do in your Porto itinerary is to start from top of the city (near Clerigos Tower), towards Gaia, Porto. In that way you can explore all the intermediate sights, drift around the nice streets with colorful houses and end up to both sides of the harbor for the dinning options, museums, wineries and… chestnut delicacies! The Porto Historical Center has received the status of Cultural Heritage of Humanity by UNESCO in 1996. Other World Heritage sites in Portugal are: The Historic Center of Guimarães, the Alto Douro Vinhateiro (Alto Douro Vineyards) and the Vale do Côa (Côa Valley). Pretty cool name, I know. Sounds like something from Game of Thrones, but not related at all. You can visit the tower, the museum and the adjusting church. All are related to the Brotherhood of Clerics. The overall architectural complex is considered a National Monument. 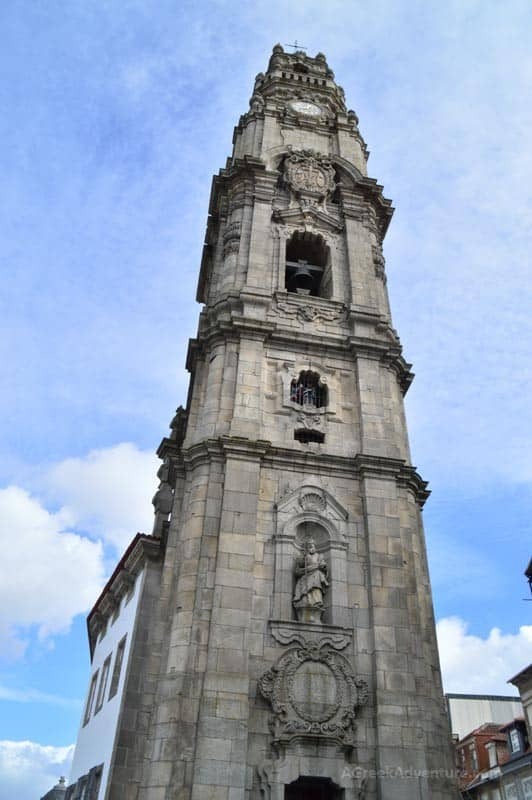 The tower is the most iconic thing in Porto and can be seen from various points of Porto. The museum is related to exhibits from the daily life of the Brotherhood. It hosts permanent and contemporary exhibitions all related to religion aspects. As usually, you learn about a place by 2 ways: walking around and eating around. We like both, but have a tendency to walk a lot and take breaks every few hours, sitting in small cafes or anything that attracts our sight as “interesting”. 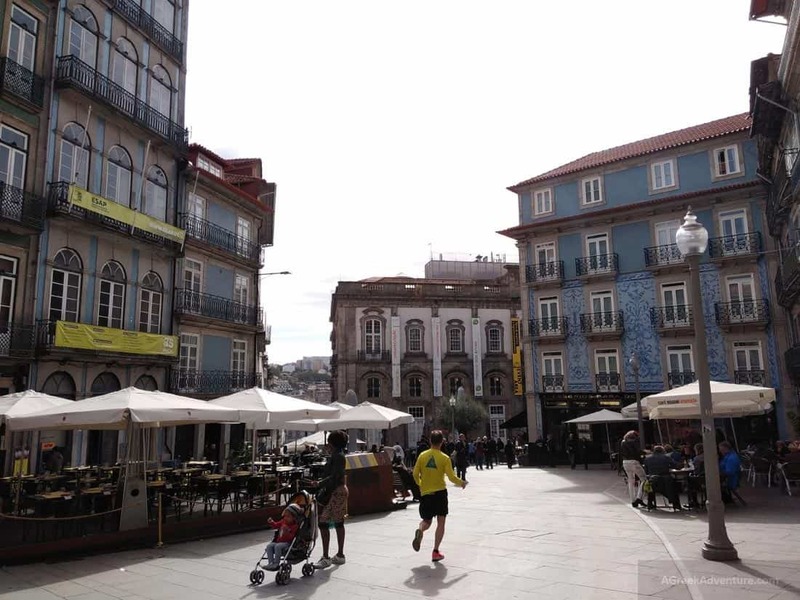 Porto is a city you will like to walk through, if you don’t have an issue with uphill roads. Parking near Clerigos allows you to slowly move downhill. You can always take a cab or a bus to get back, if you feel too tired (or too drunk from all the Porto wine). The city has nicely colored buildings with the typical no-balconies architecture. Grass here seems being way too bright green. There are plenty of stone paved, no-car, streets where people sit and enjoy the sunshine, wine and “attractive” plates of cheese and meat. Watch out for the tram though, as it swirls through narrow streets and you may walk on one of them. If you want to visit one Museum to get the essence of Porto, then this museum is your best option. It is the most prominent museum in Porto. The museum now resides inside the Carrancas Palace, the country’s oldest palace. There are plenty of artifacts related to ceramics, sculpture, engravings, jewelry, furniture, paintings, textiles and glassware. The most impressive collection is that of António Soares dos Reis, a Portuguese sculptor born in 1847. As you assumed, the Museum was named after the artist! 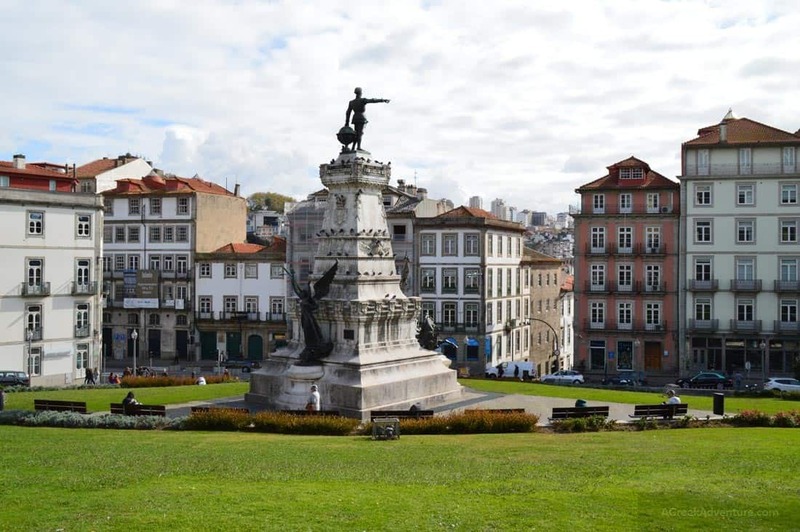 That is the most known square in Porto. Praça da Ribeira is included in the historical center of Porto. It is a rendezvous point for locals, next to the riverside (riverside is Ribeira in Portuguese). There are lots of restaurants here and the whole riverside is a promenade place, so people walk up and down simply enjoying their walk. All the wineries worth visit are at the Gaia side of Porto. We visited one that was immediately after the lower bridge that connects Porto with Gaia: The Burmester Winery. This is a visiting winery, offering a really informative tour on how Porto wine was conceived and why it is different from regular table wines. On top of that you get to taste 2 to 4 different Porto wines. You actually choose which option you want and pay for that with your ticket fee. You guessed right. We took the 4 per person option. A day before, we tasted some Porto wine in Lisbon and we were surprised by how tasteful and strong it was. It was close to the taste of a brandy/cognac than of a wine. 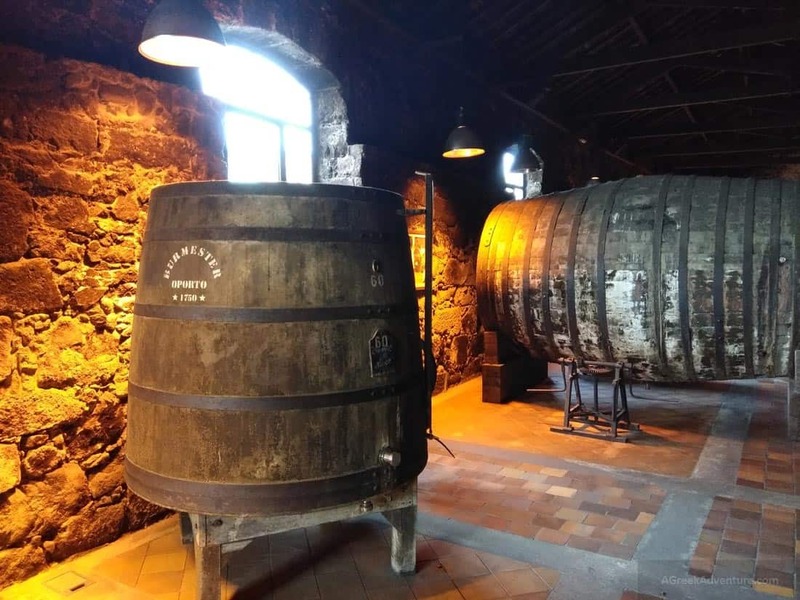 Through that winery tour, a sommelier explained why this is the very essence of Porto wine and how it became like that. Apparently, Porto wine was a regular table wine at first, still with its varieties depending on the “terroirs” and year and ways of production. However, Porto was also shipped to other countries like United Kingdom and France. Trips back then took months to complete. That led to losing part of the production due to trip circumstances, weather, storage and the constant movement of the ship. To cope with some of the reasons that allowed the wine to go bad, wineries had to find a way to make the wine last longer and become more durable. Guessing what they did? They added brandy and also increased alcohol. That changed the wine quite a bit. It became a strong “wine” that -when you taste it- feels sweeter and stronger. 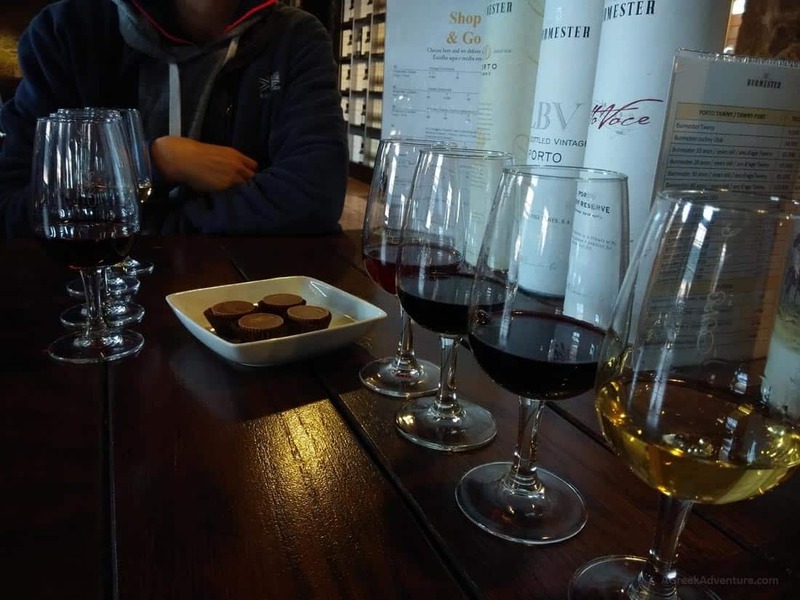 Well we landed that too, through tasting 4 different varieties each along with some chocolate to “clean the palate”. We got pleasantly dizzy really fast. It was amazing how tasteful wines were. Each glass of white, rose, black was equally interesting. You could literally “taste the quality” of that wine. We highly recommend visiting one or more of the wineries. Another one -recommended by friends who visited Porto- is the Sandeman winery. That is a pleasant way to experience big part of Porto. 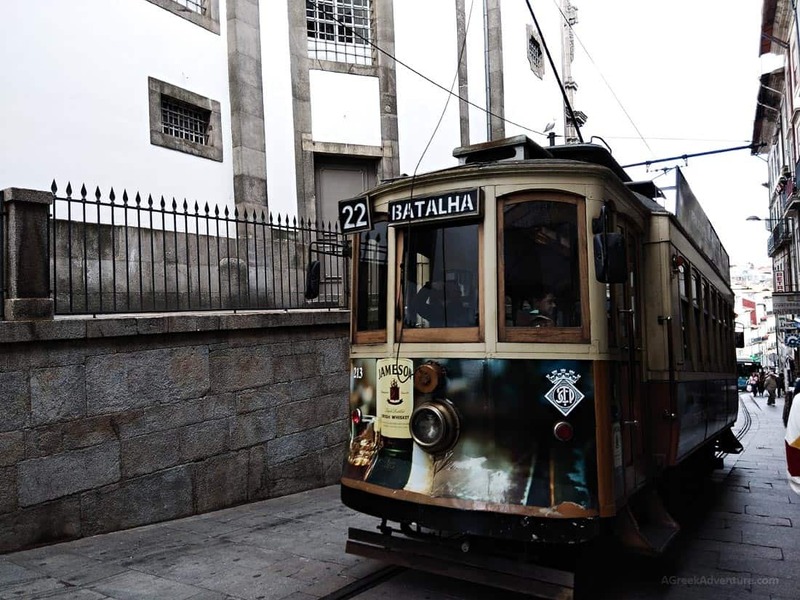 The iconic old-stylish tram is a standard method of moving around in Porto. They go through many of the landmarks of the city and you can skip lots of uphill walking. There is the city of Porto and then you can get across to Gaia. As said, all the worth visiting wineries are on that side, plus to enjoy the view towards Porto side. When you go up, go head to the belvedere, next to the bridge. There you can sit at one of the stone benches and enjoy the view. No need to take the cable car if you want to walk all the way uphill. It is a nice walk but we thought of it as a small waste of time, as the view from the top is what is matters. From there you can get in as much of Porto as you can, as you see all the buildings and most of the by-the-sea neighborhoods. Leaving the top of Gaia you walk through the highest point of Dom Luís I Bridge (Luís I Bridge). 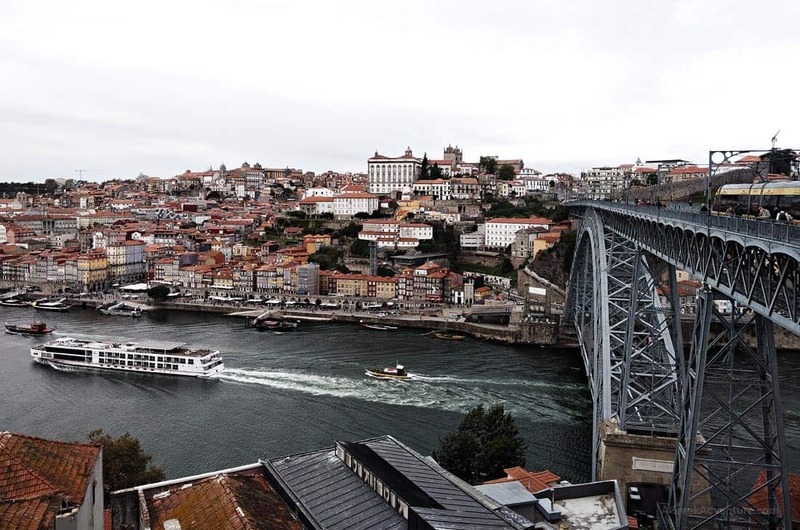 That is a double-deck metal arch bridge over the river Douro that connects Porto and Vila Nova de Gaia, When it was build it was the largest in the world. At the end of the bridge your are back into Porto and you can explore the upper part of the city. Walk the Gaia Riverside! Watch the small decorated with barrels ships along the pier. Many will do the same as it is a nice way to admire the opposite side overseeing Porto harbor, while tasting some chestnuts. That is one delicacy you must not skip. There are many small sellers who roast chestnuts on coal stoves on the spot. 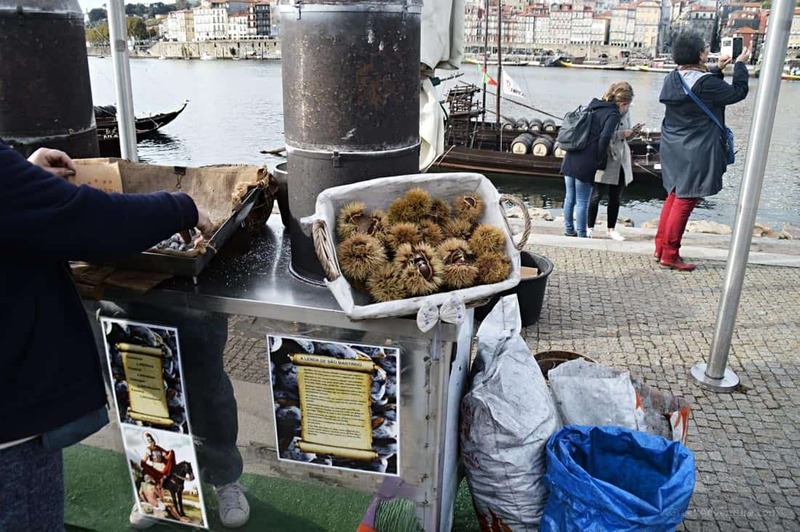 With 3 euros for a dozen of chestnuts, you get some guaranteed culinary satisfaction. No worries about the chestnut outer shells… You get your chestnuts in a dual bag, where one is to place the shells. Really clever and simple. We double dare you to taste the most iconic and characteristic food of Porto. That is a variation of a French toast, filled in with 5 or more types of meat, covered and grilled in cheese and finally served dipped into a “secret sauce”. 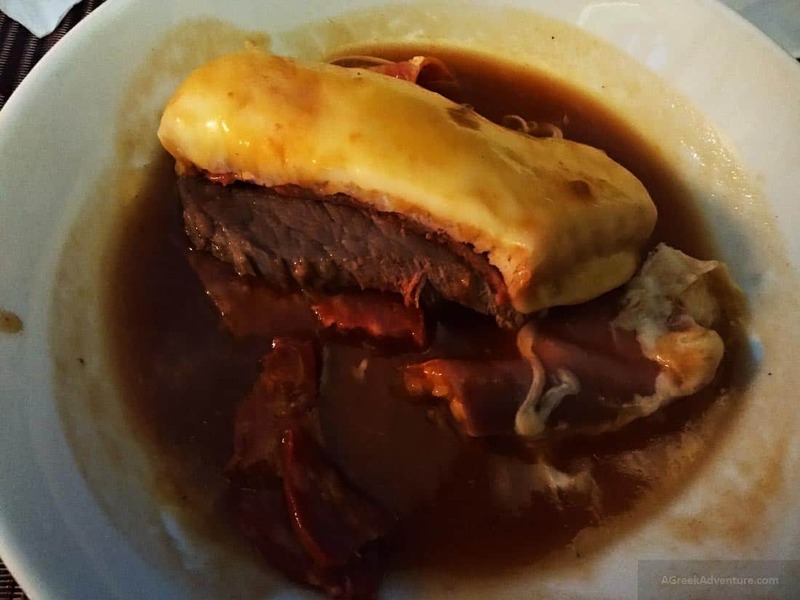 That is the Francesinha sandwich! Each shop here claims to have their “own secret sauce” recipe, however beer is the base for that sauce. I, Chris, called that sandwich as: The “Smelly” Sandwich. The smell was way too strong for me. It could be the beer or the type of cheese or maybe all the combination of the above. Paradoxically, Maria liked it! She ate all of it. Anyway, you have to taste it to know. 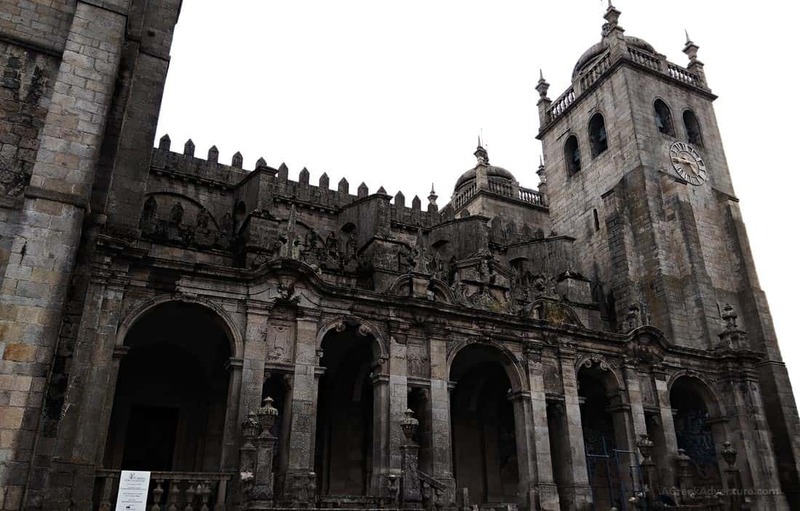 A Roman Catholic church and a religious edifice in Porto, also declared a National Monument. The building looks a like a fortress. It took quite a while to build it, that is why you will notice a series of different architectural styles in its structure. Porto is not famous for its beaches, besides the fact that is next to the coast. However, in close distance there are some popular beaches. The closest one is Praia do Carneiro and Matosinhos beach. 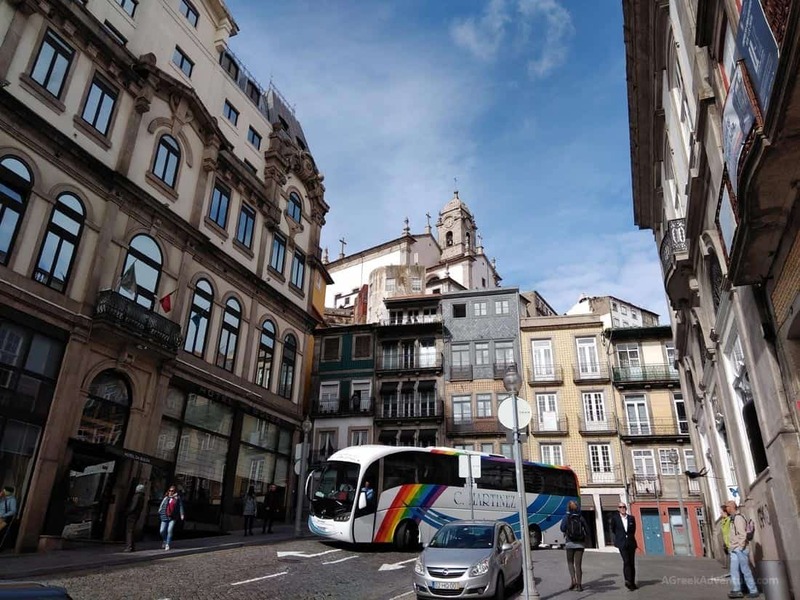 If you prefer someone to plan your day(s) in Porto then you can check these guided tours for ideas. 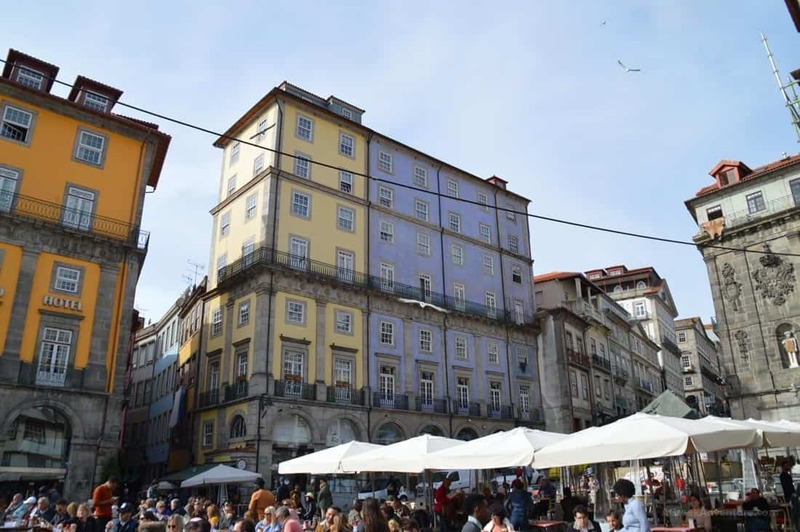 The best areas to stay in Porto are the districts of: Ribeira and Baixa/Sé. In case you prefer a more “business like” neighborhood then Boavista is your case. Finally, the scenic wineries district, Vila Nova de Gaia has some nice hotels for romantic couples. 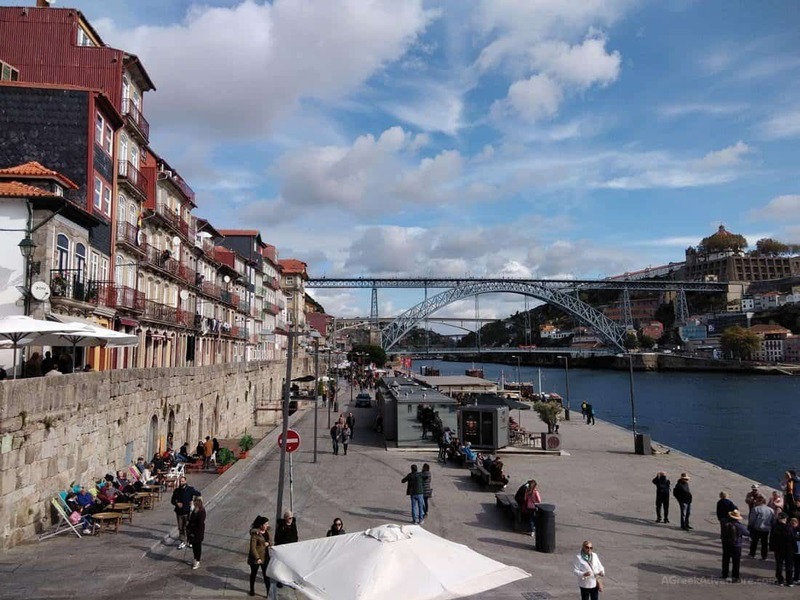 Ribeira is part of the historical centre of Porto. Colorlful houses and the riverside make a beautiful ensemble for this district that was also the heart of medieval Porto, now a Unesco World Heritage monument. Lots of bars and restaurants, not only at the riverside, but also along the narrow streets. 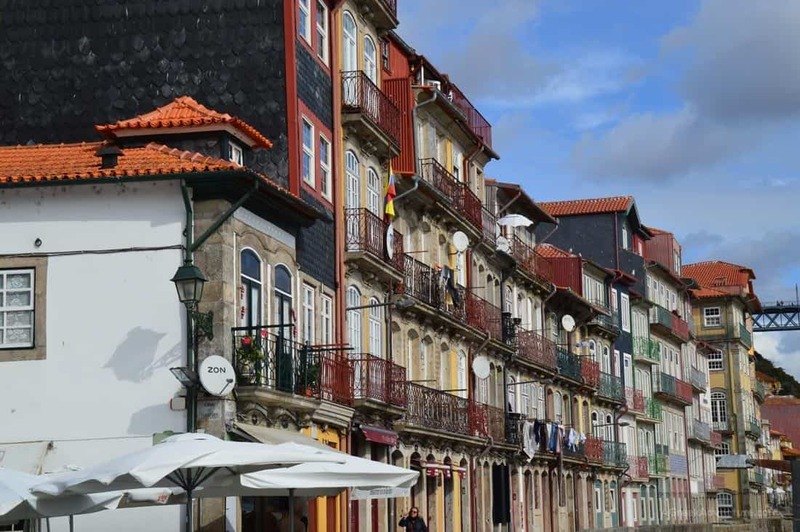 Some good options to check for accommodation in Ribeira district are: Pestana Vintage Hotel, 1872 River House, InPatio Guest House, Oporto Loft, 4* Hotel Porto River Condo Hotel. To experience some of the oldest and most atmospheric streets of Porto, this is the place. The Porto’s ancient cathedral is also here, above the river Douro as well as the Paco Episcopal (the palace of the bishops of Porto). You may heard of São Bento train station. You guessed it right, you will find it here too. Baixa on the other hand has plenty of interesting landmarks, like Torre dos Clérigos. The Igreja do Carmo is famous for its azulejos tiles. If you like Harry Potter then the most famous bookstore in Europe is here. The Livraria Lello is the place where JK Rowling received inspiration for her Harry Potter books. Check prices for accommodation in Sé and Baixa districts: Intercontinental Porto – Palácio das Cardosas, Flores Village & Spa, B The Guest Downtown. Some nice options are: Sheraton Porto – Hotel & Spa, Porto Palácio – Congress, Hotel & Spa, Hotel da Música. 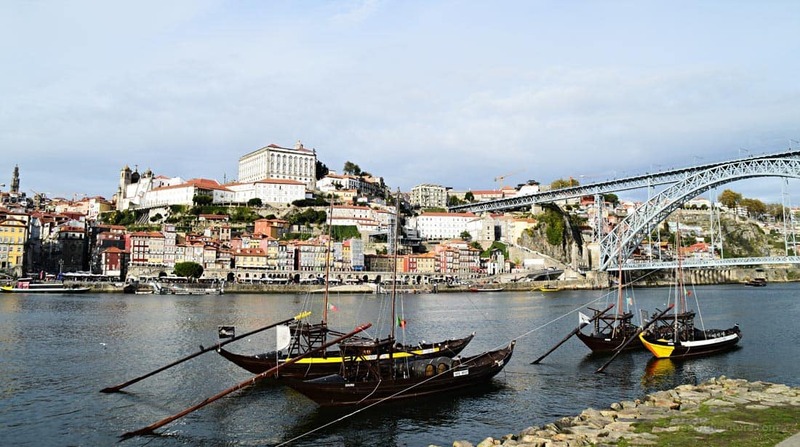 You already read our experiences in the Gaia part of Porto, so you are for sure staying in a really interesting place. Gaia is the part we described, plus the actual Gaia living area which is more than the landmarks and Luis bridge. Great places to check in Gaia for accommodation are: The Yeatman, Reis de Gaia, Charm Guesthouse. There is an airport near Porto (Francisco Sá Carneiro Airport), so that is an option in case you want to start your trip in Portugal from Porto. It is just 11km from the city centre. Check for prices early from here. In case you are staying in Lisbon or somewhere between Porto and Lisbon there are different options, train incuded. Lisbon to Porto train: Travel time is around 3 hours (same with driving with a car) with the quickest rout being around 2.30 mins. Train leaves at 06:00 but there are around 30 train departures in total between Lisbon and Porto (15 per destination and around every 45 minutes).&nbsp;All trains for Porto depart from Santa Apolonia Train Station (final stop of the Blue Metro Line). In Porto, the train stops at Porto’s Campanha station. Check this site for European Rail Travel. Drive with your car: If you want to drive from Lisbon to Porto it will take you around 3 hours but you have the option to visit more places along the way. The highway is really easy to navigate and in excellent condition. Renting a car in Portugal is not expensive at all. In fact we found the lowest rental fee compared to many other European countries, booking through a popular company. Tolls are around 30 euros in total. Bus from Lisbon to Porto: Numerous buses do the route between Porto and Lisbon. Prices are similar to train services but make sure you book ahead. Well, we believe you got a really good idea on the things to do in Porto, Portugal and how to plan your staying there.